Huntress & Shopkeeper, Ariene C. Bethea is fueled by her thrill of the hunt! Her design style is heavily influenced by her mom’s flair for mixing Hollywood Regency, Mid-Century, Chinoiserie and African art into spaces. Growing up in a home infused with art and culture has influenced Ariene's eclectic casual style, and her playful use of patterns and color. 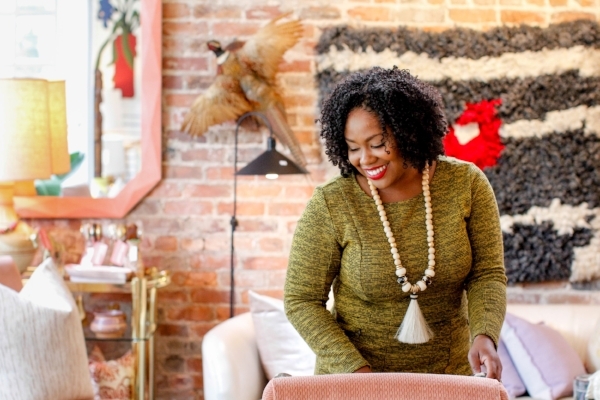 While working toward her dream of a brick and mortar, Ariene co-founded Elle & Bae, named BEST in CHARLOTTE for their curated high-end furniture and home decor boutique pop-up shop events. Years later, she co-founded The Olive Guide Magazine, a digital shelter magazine showcasing designers and creatives of color -- the first of its kind. Ariene was also a regular contributor to Four Magazine interviewing Interior Stylist & HGTV Design Star Emily Henderson and Interior Designer Nikki Chu. And while working as Lifestyle Editor for Charlotte Style Magazine, Ariene created a regular series called "My Favorite Place" featuring homes of local Charlottean bloggers and socialites. Originally from Washington, DC, Ariene holds a Master's in Management Communication from Emerson College in Boston, MA and a Bachelor's in Corporate Communication from Elon University in Elon, NC. Located in Charlotte, NC, Dressing Rooms Interiors Studio offers an artistic collection of designer and designer inspired vintage home furnishings in fresh color combinations and graphic patterns mixed with ethnic pieces (African, Asian, Indian, Italian and Moroccan) for a soulful feel. Our favorite pieces have warm woods, worn leathers, fretwork, faux bamboo, brass and chrome. The prominent and crown like presence of The National Museum of African American History and Culture on the National Mall, means that our American history is finally being told. The stories that have been left out of history books for generations and never taught during BMH are being shared all year long, and not just in February is the greatest gift. Lead designer David Adjaye being chosen to design the NMAAHC is history by itself and should be celebrated. Lately I’m drawing inspiration from vintage art, specifically pieces from the 1960’s. The color combinations are amazing! Jewelry is another huge source of inspiration, especially finding clever ways to place it in a room. The classic look of black and white will forever be a favorite, and I enjoy finding new ways to layer pattern on pattern.